WAM’s annual 6-months Life Skill & Vocational Training is underway! WAM’s Executive Director Alson Kelen and staff held Orientation Day with the trainees on Monday, April 23. This year’s trainees include 3 young women with the hope of adding more to round it up to 25 total trainees. 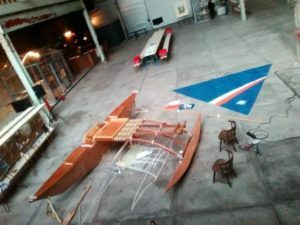 October 18 until November 18 was a special time for WAM in world-renowned The Hague, Netherlands. A dynamic exhibition program known as Climate as Artifact was on full display in which artists, designers, scientists and society were brought together to review our perception of culture and nature. 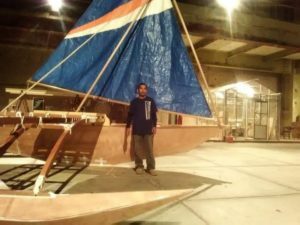 Amidst all of the various exhibitions was our very own lead trainer from WAM, Isocker Anwel, designing and building a traditional Marshallese canoe. 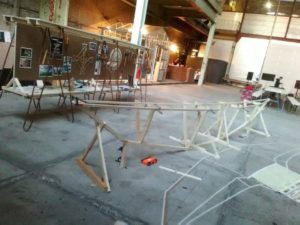 Isocker was invited as a representative of WAM by Esther Kokmeijer to help build a traditional Marshallese outrigger canoe for the exhibition. Isocker left for The Hague on October 15th. 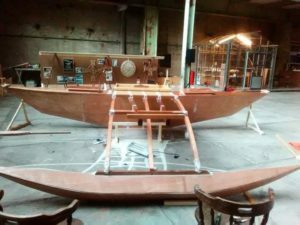 Upon arriving, the task of building a traditional sailing canoe in just under 2 weeks started right away. 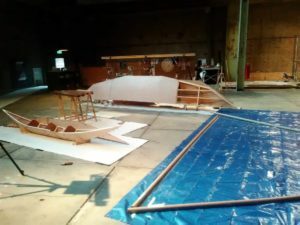 Working closely with Esther Kokmeijer and Henrik Richter-Alten (GIZ) in building and designing a traditional Marshallese outrigger canoe thousands of miles away from home left a big mark on Isocker. “To see that even thousands of miles away, people want to know more about my culture, and a big part of that culture is centered on our canoes, that left a big impression on me. 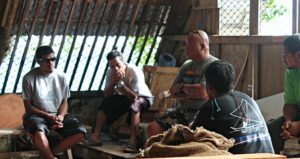 It taught me that that what we do in WAM is important, not just for Marshallese, but for other cultures as well.” This kind of trip and exposure goes hand-in-hand with WAM’s mission since its inception in the late 1990s, which has always been to work with the youth, their families and the local and international community to preserve and protect Marshallese culture and tradition through canoe building and sailing, and through this cultural connection develop life skills and a work ethic that creates meaning in the lives of all participants. 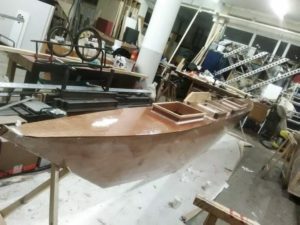 The structure for the canoe is laid out! Epoxy being applied to the canoe. Complete and ready to sail! September 27, 2018 was an exciting day for 22 young people, a group of 18 young men and 4 young women! For them, Graduation Day was the result of 6 months of hard work and determination. This was their time to shine, to express appreciation, and to reflect on what they had accomplished in the last 6-months. Community leaders, board members, friends, and family attended this event which was held under the big tree at the shoreline of WAM. Kumit Bobrae Director Janet Schmidt was emcee of the event with over a 100 people in attendance. 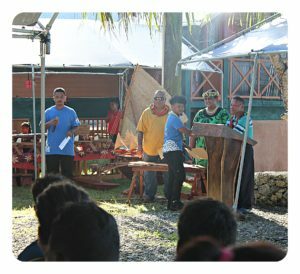 Opening remarks were made by graduate Angie Abal in English and Darween Gideon in Marshallese expressing on behalf of their fellow trainees their appreciation for this unique opportunity to be given a second chance in education and be encouraged to better their lives during this 6-month program. Graduates with some of WAM staff. Graduates singing a song to show their appreciation. Graduate Angie Abal delivering the opening remarks in English. 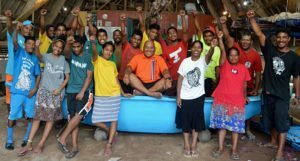 Every year one of the highlights of the WAM Life Skills Vocational Training Program is the Eneko Retreat. 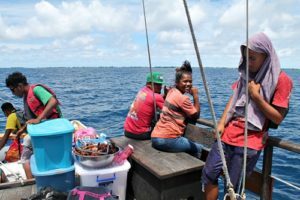 As part of the WAM NTC program, trainees are provided with the opportunity to learn traditional knowledge and skills (manit) and use them during a 4 day retreat to the islet of Eneko. This year, a total of 32 (22 trainees and 10 staffs including family members) participated in this event. One of the main objectives of this retreat is also to enhance the trainees life-skills, such as traditional life-styles, collaboration, communication, and substance abuse & drug abuse prevention. 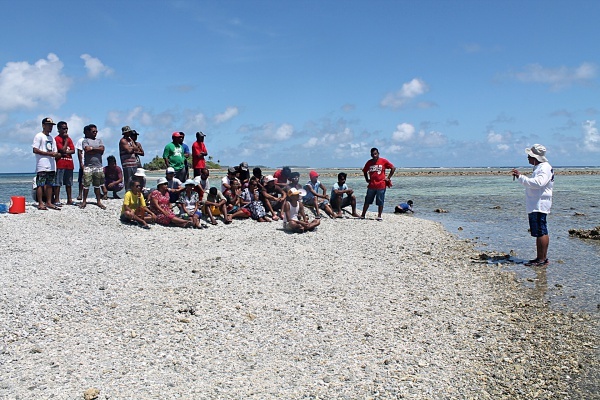 Some of the activities covered during the retreat were fishing (line, throw & long-net), weaving of Marshallese baskets, under-ground cooking, cooking of traditional foods, and hunting. 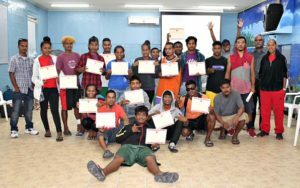 These activities are very important for the trainees to learn and understand as they are very much a part of the Marshallese culture. 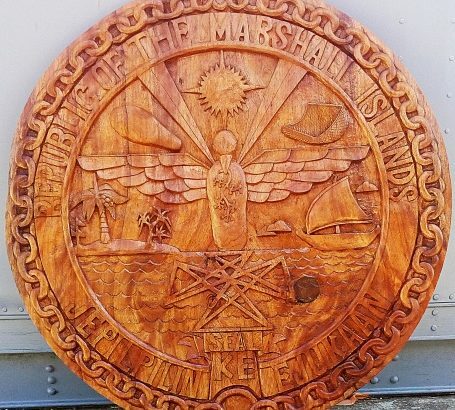 Many trainees have lived in the outer islands, but they said they learned a lot about Marshallese traditional skills that they never knew, while participating in this retreat. 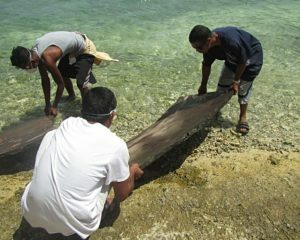 WAM partnered with Kumit Bobrae Coalitions (KUMIT) and Okeanos Marshall Islands (OMI) during the retreat they helped WAM to provide valuable skills and knowledge. The Kumit Out-Reach team provided WAM trainees with an Out-Reach program that covered the topic of DUI’s (driving under the influence). Trainees really appreciated being able to understand how dangerous drinking and driving is and what can happen if you do so. By the end of their activity, 100% of the trainees vocally reported that the activity really enhanced their decision-making toward DUI. 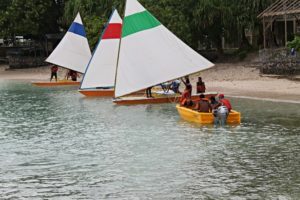 Later that same day the Okeanos of the Marshall Islands instructed the trainees on water safety and sailing. 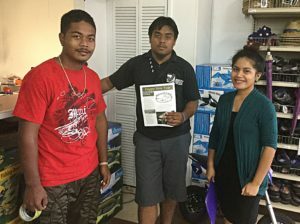 The two representative from Okeanos Marshall Islands made clear the importance of sailing without using fossil fuel. All these activities engage and involve the trainees, which facilitates a fun learning experience. In order for the retreat to start, proceed, and end well WAM Staff and Trainers split trainees into 3 groups. Each group had two trainers and 1 counsellor assigned to it, this enabled each trainee to get the most benefit out of the retreat. These groups were assigned to rotate certain responsibilities, which included breakfast, lunch, and dinner preparation. The trainees were evaluated on the last day of the retreat and a survey was given to the trainees to express how they felt about this life changing retreat. Kumit OutReach employee Junior Kaisha providing an activity on DUI. Trainees pictured are Henchi Tobey & Tom Schmidt. Photo: Rosan Bartolome. Welcome to WAM’s annual report for the year ending September 2017. WAM has had a busy and productive year that saw 32 trainees graduate and gain skills, knowledge, cultural appreciation and confidence to make positive choices for their future. WAM is looking forward to forging new partnerships in 2017 and 2018 that will provide more opportunities for our young people to learn life changing behaviours in a changing world. 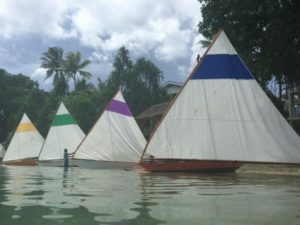 To work with youth, their families and the local and international community to preserve and protect Marshallese culture and tradition through canoe building and sailing, and through this cultural connection develop life skills and a work ethic that create meaning in the lives of all participants. 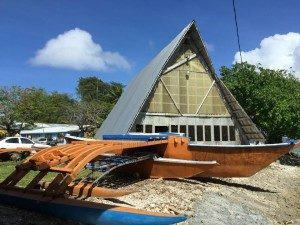 The Waan Aelõñ in Majel (WAM) first began as a project in 1989 documenting the designs for and building of traditional outrigger canoes in the Marshall Islands. 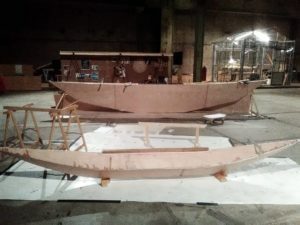 Six canoes were built over seven years on the outer islands where the history, songs and ceremonies involved with canoe building were captured. 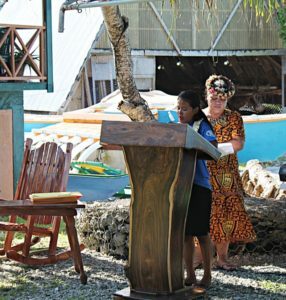 Since 1999, WAM has been a grass roots, non-profit organization educating young ‘at risk’ Marshall Islanders in the traditions of building and sailing wooden canoes. WAM has continued to develop and grow as an organization that provides vocational and life skills training, counselling and substance abuse treatment for youth-at-risk, using canoe building, traditional and contemporary boat building, sailing and navigation, wood working and weaving.WAM’s programs are designed to educate and empower young people, link the new generation with the old, working together to keep this unique aspect of Marshallese culture alive. WAM is anchored by values and guiding principles that have been core to the organization since its formation. All trainees participated in and were supported throughout their training via the Life Skills Program, funded by Substance Abuse Prevention and Treatment (SAPT). The trainees’ traditional products they had made were on display during the weeklong conference. 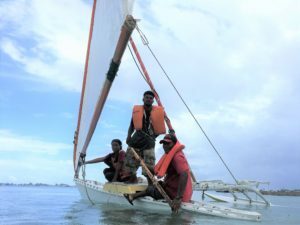 WAM trainers and trainees participated in welcoming this sailing vessel donated to RMI by the Okeanus Foundation. 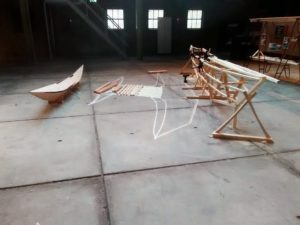 The trainees’ this year displayed and demonstrated how to construct canoe models, repair traditional fishing nets, weave traditional baskets, and demonstrate construction of rowboats. A key aspect of this event is that trainees are able to explain the different activities using Marshallese and culturally appropriate names. The criterion to apply for the GEF program is to be aged 18 and older, unemployed and interested in advancing in carving and woodworking skills. 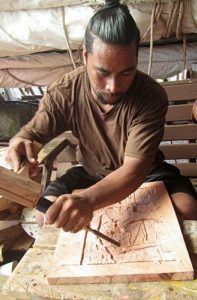 Trainees were taught how to make wooden checkerboards, picture frames, traditional spear and paddles and various carved wooden objects. An Open House was held on June 26, 2017 showcasing a variety of wooden handmade products, carved from the lumber milled from the Lukwej tree and other local wood, by the trainees. 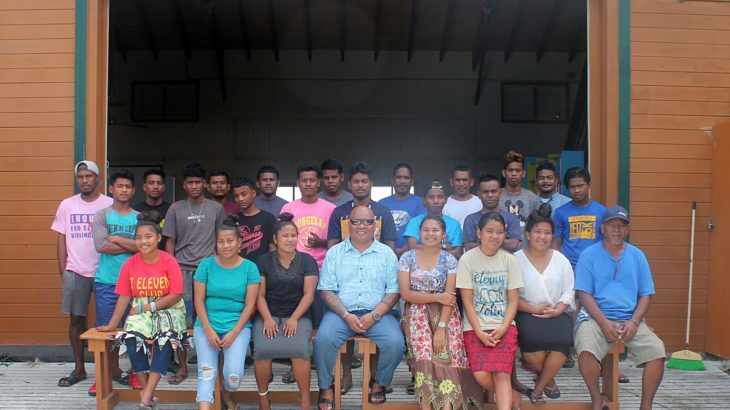 Fourteen trainees graduated from the program in August, with two trainees leaving early as they had found employment. 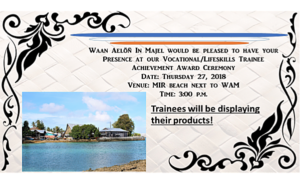 The Open House was attended by community and family members and provided the opportunity for all WAM trainees to use their Life Skills training in communication and customer service skills. 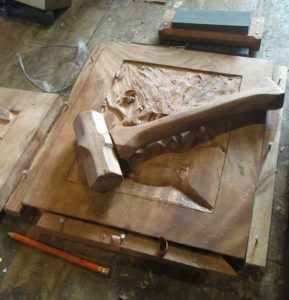 Trainees enjoyed the carving and learning to make furniture out of local wood. Trainees said that the program was very good and they only hoped that more young people could be recruited to attend. All Trainees recommended the program becasue it has helped them increase their knowledge and skill level in many ways to prepare for the future. We have two counselors who work with the trainees from day one of each program to assist them to complete their training, open bank accounts, receive health checks and continue to provide counseling support three, six and 12 months following their graduation. A total of 90 trainees received counseling support via face-to-face meetings for this year. The counselors also interviewed 71 applicants who came by appointment to apply for WAM programs. Life skills are a key ingredient for becoming job ready, which the trainees are provided support for, with on the job training and interview and resume preparation. By providing counseling support throughout the program, trainees are seen to have an improvement in their attitudes and behaviors, enabling them to set goals, attend regularly and complete tasks. A 20-year-old male grew up in the outer island atoll of Ebon. After graduating from Ebon Elementary School, he then went to Jaluit High School for further education. Unfortunately, he was expelled from the High School due to alcohol use. He was afraid to return to his home island because he thought that his father would beat him for being expelled. Therefore, he came to Majuro and lived with his uncle in Rita. For several years he did not attend school or have a decent job because of his abuse of alcohol and drugs. It is while attending the WAM program that he gained motivation to make changes in his life. When he first began attending the training program, he had low self-esteem. He never mingled with his fellow trainees, but only his prior associates from Rita. After he attended several counseling sessions, he was given treatment plans to enhance his confidence and reduce his substance and drug use. He applied the counseling he received and put effort into changing his destructive habits. He began to work towards a better future and became one of the most outstanding trainees. He was chosen to be the Trainees Vice President, and given the chance to teach his fellow trainees to sail. His projects were done before everyone’s. Surprisingly, after the post Behavioural Health Screening he scored low on alcohol, drugs, and tobacco. A quote from this trainee was, “my past may have dragged me back for a while from my future, but now it won’t stop me from trying my best to accomplish my goals”. It’s beyond others expectation that this talented trainee would have made it through the program because of his past. As a matter of fact, he proved to himself that nothing’s impossible as long as you are willing to face the past but move on for a future. During his final counseling session, he said that his father already forgave him for running away. Currently, he is scheduled to be interviewed as a perspective employee of a local business. A soft spoken, shy, young woman who graduated from the WAM program experienced a major transformation. She came to WAM a shy person with low self-esteem and having no plans for her future. Over the course of the program she became more outgoing, displayed a confidence she had not had before and now has plans for the future. During On the Job Training she excelled in her placement at a local salon and was offered a full-time position as an esthetician. She is currently employed at the salon as she awaits the GED placement test in December. She plans to attend GED this fall semester and finish GED while working part-time at the salon. It has been exciting and encouraging to see how the WAM program can change lives. Director Alson Kelen with trainees giving instruction on climate change and the importance of protecting the environment. Trainees and staff participated in the annual retreat from July 3-6, 2017 on the islet Eneko. The retreat focused on communication, collaboration and decision-making and the importance of learning to work together. 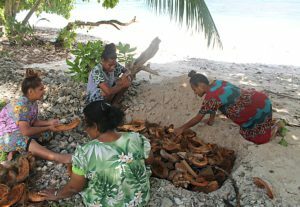 cook Marshallese traditional food using the traditional (underground) oven. Climate change was one topic discussed and how our culture is adapting due to the effects of climate change in the Marshall Islands. The retreat was a fun and successful event that prepared these young people to implement their goals and help them make decisions for their future. 17 Trainees attended a two-day first aid training course delivered by the Marshall Islands Red Cross. The course gave instruction in basic first aid techniques related to resuscitation, choking, seizures, cut, burns and breaks. Evaluation templates, curriculum, lesson planning, proposal and grant writing instruction was provided by Rae Plush an AVI volunteer to the WAM administration. Director Alson Kelen and Associate Director Tamara Bowman completed the Project Management for Development Professionals a project management course delivered by Rae Plush. 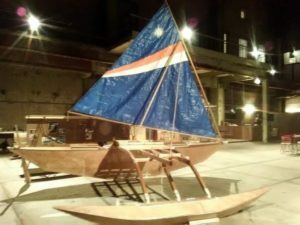 Throughout the year WAM has promoted its work and accomplishments on the website, Facebook, displaying at various community events, selling made to order traditional and contemporary products, and providing tourist with sailing tours. We rely on local and international partnerships for our programs to be delivered. We thank our sponsors for their support and look forward to future partnerships. 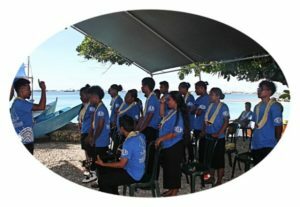 For a complete copy of the WAM Annual Report 2016 to 2017 or a copy of the WAM Strategic Plan please feel free to contact us at canoesmarshallislands.com. 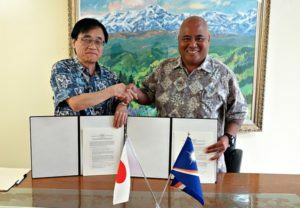 On Wednesday, November 1, 2017 Ambassador Hideyuki Mitsuoka of Japan and Director Alson Kelen of WAM signed a contract for “the Project for Improvement of Transportation of Training Materials for Waan Aelõñ in Majel in Majuro Atoll” at the Embassy of Japan. The signing ceremony was witnessed by WAM’s traditional canoe building trainer Binton Daniels and officials of the Embassy of Japan. The funds provided by this contract will facilitate the purchasing of a crane truck. Previously, do to the expense of renting transportation for logging purposes WAM could only offer programs using lukwej and breadfruit logs. Because of the Grassroots Grant Project funding, WAM will be able to advance their training program with coconut trees as well as the other woods. Furthermore, this project will also promote the RMI’s coconut replanting program and promote an increased awareness of the ability to produce local products from local sources thus increase cultural pride. WAM appreciates this support from GGP and is excited to have this opportunity by means of this additional equipment to diversify and enhance their training programs.